You are here: Home / #DamnitCarl / #DamnItCarl Podcast 20: What am I Doing Wrong With My Weight? 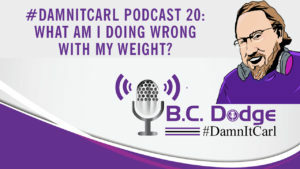 #DamnItCarl Podcast 20: What am I Doing Wrong With My Weight? On this #DamnItCarl podcast B.C. Dodge asks – what am I doing wrong with my weight? In this follow up video to “Do You Know How Food is Affecting You?” B.C. dives in a little with his personal story on his struggle with weight loss; which is complicated with this holiday season. He also touches on the idea that men have body issues too. Having body issue is not specifically for women. B.C. has always struggled with his weight. As a teen he was a little larger than the other boys. Even in the military, right out of boot camp, he still had a little bit of a belly. He has tried to get rid of it and was doing well…but then came the holidays and all the food. He is determined to get back to using his Instapot and back on track with his diet, he has to lose the weight again…not just for physical health, but for his mental health as well. With all of that being said – if you have any Instapot recipes that you would like to share, that are Keto friendly, please feel free to leave them in the comments! Make sure you subscribe to what will become one of the best podcasts right now. And also check out all the podcasts on the Venn Network and make sure to like, subscribe, and share this the content.